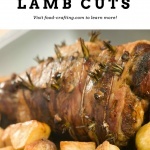 Leg of Lamb Cuts – We love lamb! In summer, we grill the Frenched chops and in winter I roast the entire rack of rib chops. 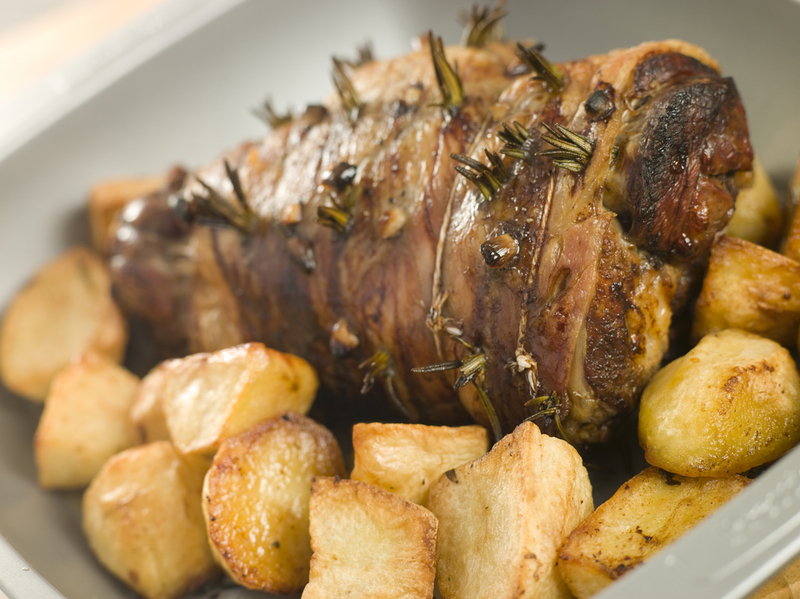 At Easter, our traditional meal includes a beautifully roasted leg of lamb. Nothing fancy – just seasoned with sea salt, some freshly cracked peppercorn blend, studded with lots of fresh garlic and sprigs of fresh rosemary! 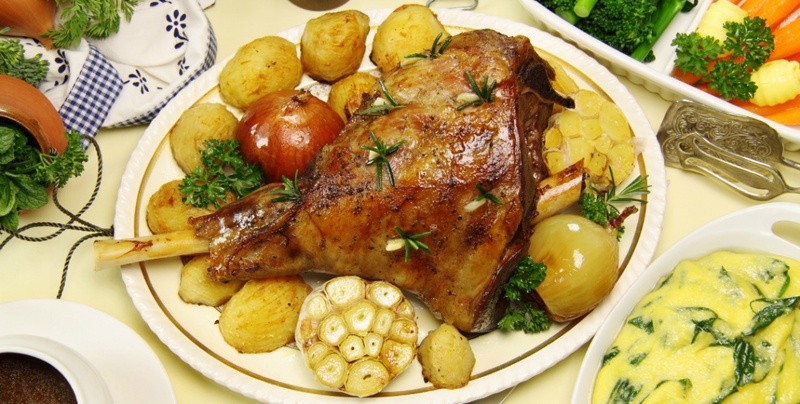 A simple Sunday dinner – Roast leg of lamb with garlic and rosemary or Wine Braised Lamb Shanks. What Are The Best Leg of Lamb Cuts For Roasts? The Easter menu includes simple roasted potatoes and asparagus. If I am ahead of the curve, I also prepare an egg and asparagus casserole. In Fall and Winter, I roast the leg of lamb with white beans and tomatoes – à la Provençale! 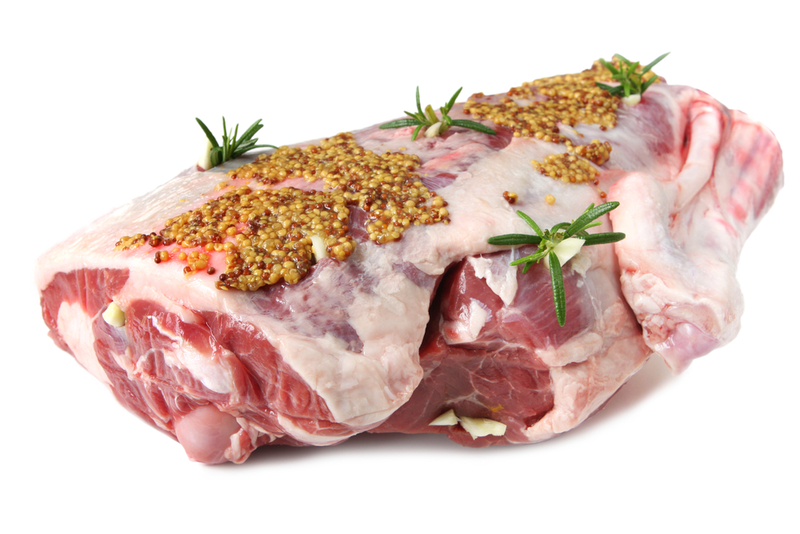 Leg of lamb can be used in so many recipes but some cuts are better suited to certain recipes. Spring is the best time of the year to eat lamb. The best tasting lamb, high quality young lamb can be purchased through Spring and into the beginning of summer. Many do not like lamb but its not so much the texture of the meat as the age of the animal when it was butchered. Anything other than young lamb tastes gamy and it tough. A whole bone-in leg of lamb can be huge – upwards of 8 or 9 lbs (feeds 10- to 12 people). That’s when you know the lamb is old or definitely older. It can also be tough because of all that running around! But I can vouch for the fact that a huge leg of lamb, slow roasting in the oven surrounded by chunks of garlicky potatoes is totally distracting. Lamb comes from New Zealand, Australia, and from the United States. It’s rare to find French pré-salé (salt meadow lamb) but it is available for sale just in time for Easter. Pré salé or salt meadow lamb is raised in the Brittany region of France as well as in the area around the Mont St. Michel – my backyard when I was toddling around. The high salinity of the salt march grass they eat imparts a very unique flavor quality to the meat. Expect to pay top dollar for a pré-salé roast. 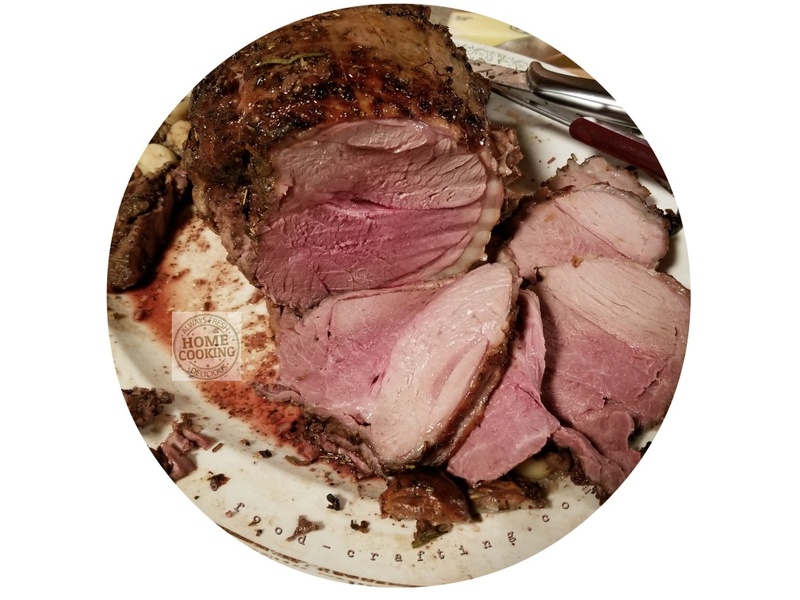 A boneless leg of lamb roast is convenient and tastes just as good but it just does not offer the same presentation. We love serving the roast lamb on a lovely oval platter surrounded by the vegetables. 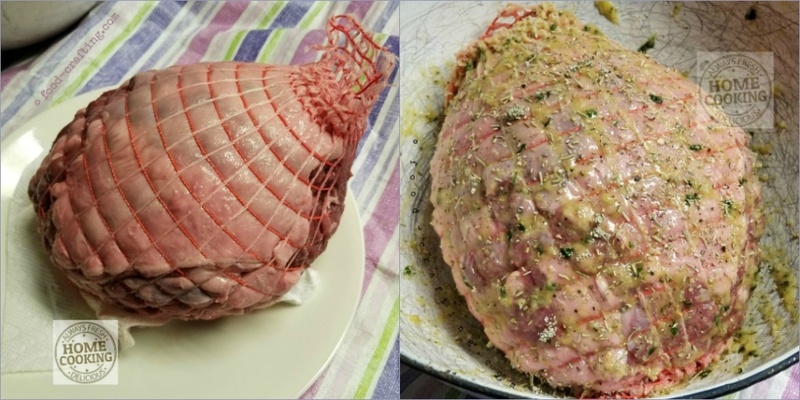 Once the net holding the roast together is cut, it is not easy to cut nice slices. You get uneven pieces. I prefer this cut when prepared with white beans, Provençal style. Look for a small, bone-in leg of lamb or a semi-boneless roast. It’s the best bet unless you are going to feed a small army as I often do. A few years ago, I purchased a leg of lamb that weighed barely three pounds! Check the butcher shop at Whole Foods® for unique cuts of meat. The meat is light in color – more of a light pink than a reddish hue. Dark red meat is almost guaranteed to be what I call “mutton” and the ideal slow cooker or braising cut. A 5 to 6 pound leg of lamb will feed 6 to 8 guests (or fewer in our family). It feeds fewer guests when everyone loves to eat roast leg of lamb. The boneless leg of grass fed lamb cut pictured above weighed 6.71 lbs. and cost $5.99 a pound. You can also select a short cut leg of lamb which fits more easily into certain roasting pans or even a slow cooker – another way to cook a scrumptious leg of lamb. Support the roast on a small rack like the one pictured here which has great reviews. It’s perfect for all slow cookers. Two racks can be shaped to fit the entire bottom of even the largest slow cooker and any leg of lamb cut. Add a couple cups of lamb broth. but check after 4 hours in case you need to add more broth. Although this recipe is prepared in a slow cooker, it is not a recipe allowed to cook unsupervised. 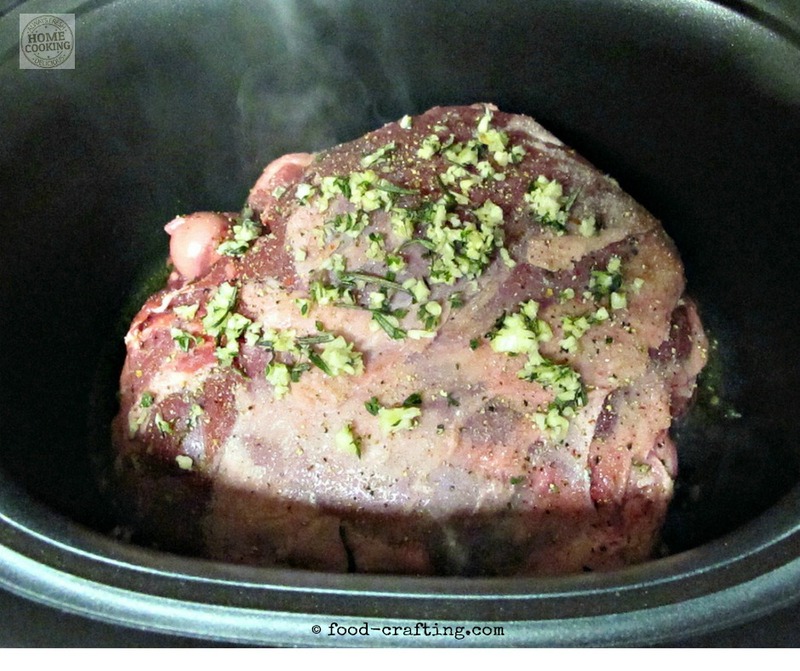 Leg of lamb in the slow cooker. Marinate the roast up to 4 hours in an apple cider vinegar marinade for the most tender meat! Sounds familiar? Click HERE to review our vinegar marinades. Set aside some of the marinade to baste the roast as it cooks. Lamb marinated this way is incredible in a sandwich. Not only does a vinegar marinade remove some of the gamy taste (if that is why you stay away from lamb) but it also tenderizes the meat. You can add loads of crushed garlic and rosemary as well as lemon juice. Try marinating the meat at room temperature for a couple hours just before putting it in the oven. If you are not going to roast it or grill it within that time frame then refrigerate it right away. Bring it out at the appropriate time so it can reach room temperature. Here is a olive oil based marinade that works just as well for any leg of lamb cuts. The well worn enameled mixing bowl belonged to my mother in law. It has become a “measuring bowl” for certain recipes. I rarely measure anything I add to it when preparing salad dressings or marinades. Cover the bottom of the bowl with robust olive oil. Add a healthy amount of crushed garlic paste. 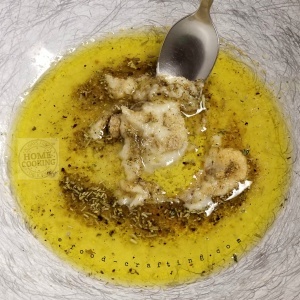 You can also crush fresh garlic but this paste is much more easily incorporated into the olive oil to create a true coating. A tablespoon of Mediterranean spice blend (the Safeway® Signature® blend is low in sodium too but contains the following mix of spices: Sea Salt, Brown Sugar, Black Peppercorns, Rosemary, Garlic, Sage, Lemon Juice Powder, Parsley and Ground Bay Leaves ) . Place the 6 pound boneless roast in the bowl and turn several times to coat completely. Cover with an airtight lid. Place in fridge or set aside if you are going to cook it within two hours. My enamelware bowl is at least 65 years old. It was used once a week to prepare her Farmer’s Market chicken and potato salads. 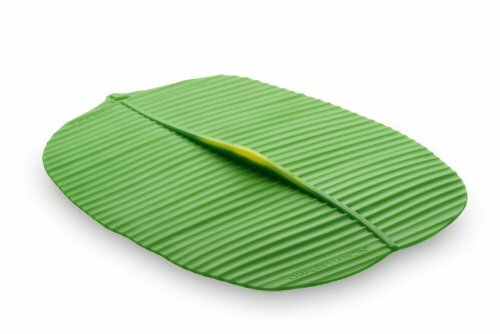 I use it for the same purpose and you will spot it in many recipe photos throughout the website. Enamelware mixing bowls are available brand new too! But what is that giant lemon slice topping off the bowl? The best thing since sliced bread. It’s an airtight silicone lid, oven, microwave, fridge safe to -40* F., stove top safe to 428* F. and dishwasher safe to boot! I have three of them and plan on stocking up on all sizes. The airtight suction is strong enough to lift up a soup bowl by simply grabbing the knob. We have our favorites but red Bordeaux, Cabernets, Merlots, Beaujolais, even a classic Chianti work well. Simple Gourmet Lamb: With Side Dishes & Wine Pairings (Black Fly Stew) We’ve even had rosé! And of course, pink bubbly works with just about any dish in our home. It’s really up to individual tastes but try a Chateau Neuf du Pape or a St. Emilion. 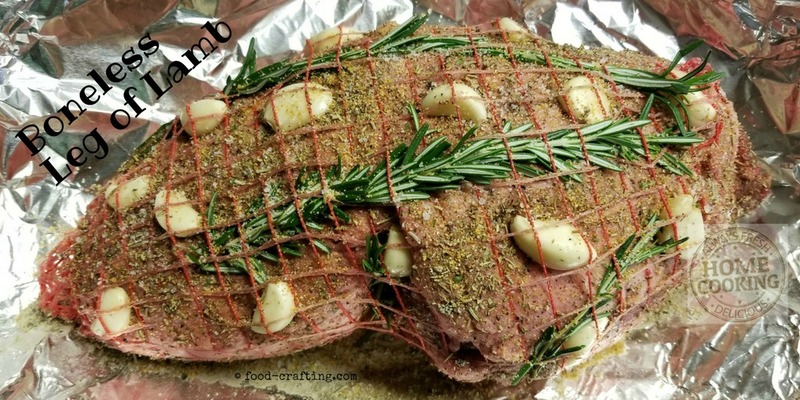 1 What Are The Best Leg of Lamb Cuts For Roasts?